Care for the environment and wish to show that love to the world? What better way than to let your jewelry do the talking? Our natural beads made from dry seeds are the perfect answer to showcase your eco-friendly nature to the world at large. These ‘green’ beads are delicately handcrafted by skilled craftsmen and their production process involves significantly less carbon emissions than any other types of beads. At The Peruvian Bead Factory, we bring to you acai natural beads in rich and beautiful colors like red, pink, orange, purple, fuchsia, browns, beige, blue, turquoise, green, yellow, black and white. They sport a characteristic birthmark of marbled lines and can be used to make earrings or bracelets. Else, you can choose to reap the good luck charm of Baby Huayruru or Male Huayruru beads in red with black dots by making rosaries or even other jewelry. Even Job’s Tear beads in varying shades of white, cream and grey are often used to make rosaries beads. 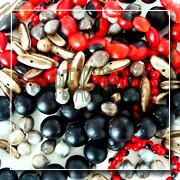 Other natural varieties like Choloque and Acacia beads are also available here. The distinctive blend of colors and textures makes the natural beads look very appealing. The shapes and sizes of the beads are bound to vary due to the natural handcrafted process, which in fact adds to their innate allure. So, what are you waiting for? 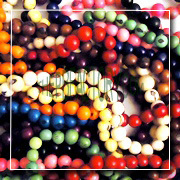 Let the organic elegance of natural beads redefine your fashion statement while reducing the carbon footprint involved! Please click on the individual product links in the sub-categories section for further detailed information about color, dimensions, hole size, weight and size of sale unit package.